Overall dimensions: 14'' H x 19'' W x 11'' D.
Weston provides limited one year warranty. This fantastic appliance features a high quality removable stainless steel blade. 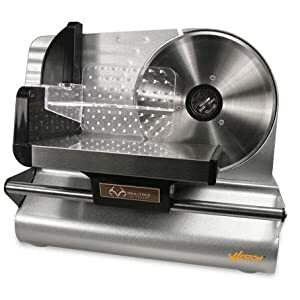 The Weston Electric Food Slicer allows you to slice quickly, safely and easily with a is very compact. Its compact design allows for easy storage and the motor is very quiet when running and will not make you wish you brought ear plugs. The removable blade and the tilted food tray can be easily removed for stress free cleaning.The sturdy base and suction cup feet allow for stable operation as the slicer will not slide across your worktop. The slicer also comes with a handy food pusher with teeth for controlled slicing. There is also an adjustable thickness control for slicing from deli thin to over 0.5'' thick.